Let us restore your floor back to its natural shine! Carreno Tile, LLC also clean tile and grout surfaces, including kitchen floors, bathroom floors, entryways, hallways, countertops, showers, pool decks and patios/porches. We utilize the most advanced technology to clean and restore your floors back to their natural beauty! Our tile and grout cleaning process offers fast, effective, and affordable solutions that work on any hard surface: natural stone; travertine; brick; concrete; and stucco. We can do it all – vertical or horizontal. 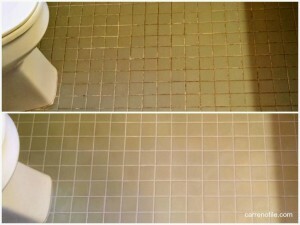 Fully clean the tile and grout: Not only do we fully clean the grout. First we use a simple cleaning solution to agitate the dirt that’s ingrained into the floor (that’s why mopping never removes it, allowing it to build up over time). We then use our patented floor tool that applies water at just the right pre-selected cleaning pressure in the Containing Dome – pre-selected at a level that precludes any damage. At the same time the water is being applied, it’s also vacuum-extracted water leaving the surface almost completely dry. Grout Coloring: There will be some problem areas that just don’t want to look new. For these minor occurrences, we use grout colorants to match your grout color. Grout Repairs: Included with every grout cleaning, any grout that is chipped, cracked, or missing is replaced. Grout Sealing: To complete the job, we will use our high-quality sealer to seal your grout and protect it from stains, dirt and oil. It isn’t finished until it’s sealed. Why waste more time and effort “trying” to clean your hard surfaces the old fashion way? Carreno Tile, LLC offers fast, effective, and affordable solutions that work on any hard surface: natural stone, travertine, brick, concrete, and stucco. We can do it all – vertical or horizontal.